When it comes to home renovation, you can save a considerable amount of money by taking care of upgrades yourself. If you have the handy skills and the patience for this type of project then there is no limit to the possibilities. There is a seemingly endless supply of Do It Yourself resources out there for adventurous homeowners, like you, that supply great ideas and tips on just about any home improvement project. You can find fantastic inspiration in books at the bookstore or online. Online, there are hundreds of interior design and DIY blogs and sites that offer up a wealth of knowledge. Remember that there is no limit to your imagination; so have fun and get creative. Here are a select few ideas for that fireplace that you keep staring at, but just can’t seem to figure out. 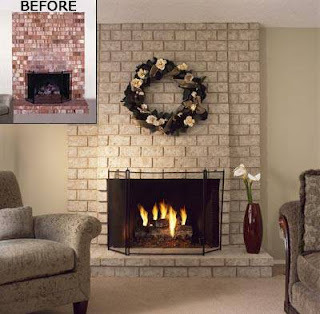 One great and easy way to take your old fireplace and give it a quick and easy update is to paint the existing bricks. You can choose a color that fits the rest of your home décor or matches the mood you are trying to create in your room. Painting is a nice way to make the fireplace more modern and it only takes a few steps, you could be done in an afternoon. Take a brick cleaning solution and thoroughly clean the area you wish to paint. Once the area is dry, tape it off protecting the surrounding walls. Use a primer made specifically for painting bricks and prime the area. When the primer is dry, go ahead and give the bricks a coat of paint, making sure to get in all the tiny cracks and cover them thoroughly. After the first coat dries, apply a second coat. When your second coat is dry, you’re done. It’s that simple. Make sure that when you are considering your paint options, you pick a paint that is oil based and will tolerate the heat well. You can, of course, just as easily paint the mantel as well, changing the whole look of the fireplace completely. Another fantastic way to spruce up your current fireplace and make it a bit more modern is to give it a good old do it yourself facelift. Depending on what style you are going for and what aesthetic you currently have in your home, you can choose wood panels, for a decorative fireplace, tile, marble slabs or any other material that you think might look good. Once you have chosen your material, you can cover the brick with it, giving your fireplace an instant update with your own personal flare. Know that painting bricks is a permanent change and you should be sure of your decision before you begin. If you choose to use tile, you can use larger tiles and create a nice pattern, or you could use smaller tiles creating a mosaic. Take the finished space and fill the fireplace with candles, creating a warm modern piece of art. This will be an interesting and eclectic conversation piece that you can be proud to show off. Don’t forget to consider the codes in your area for construction when taking on projects such as these. Especially concerning fireplaces, there may be rules regarding gas lines, or concerns about gas vs wood burning. Kelli McDonald has loved crafts and interior design ever since she was a little girl. She now works with luxury goods and online furniture deals for LuxeYard.